I got such a lovely start to the week when I got the following email. (actually the week got away from me, and this actually happened last week). "You have received a Lovely Blog Award. The reason is you inspire me and do such an amazing job with your blog. I enjoy your Danish recipes and it helps me stay in contact with my roots. Thank you. " Gitte from My Danish Kitchen sent it to me. Well, you can imagine my surprise and pleasure to receive that acknowledgement of my efforts. *giggle* Someone's actually reading this blog and likes it, gosh. I know I enjoy Gitte's posts, and if you look at my blog roll to the left, you can see she's one of the blogs that I have there. Her Danish recipes are wonderful and they in turn inspire me to try making some of the many foods I grew up with. I don't really follow that many blogs, so I had to go out and look for some, and guess what I found. Get the impression I'm kinda into Danish food? But I also like humor and the offbeat as well. 1. Post a link back to the person that gave you the award. 3. Pass the award to 15 recently discovered blogs. I'm actually quite shy, hard to believe, I know, but something I've actually worked on to be more comfortable with my whole life. I'm very proud of my Danish heritage, and will share it with you at any time, whether you want me to or not. I love to get on public transport in a new city and just ride around and see where the bus line goes. A great way to explore a city without going to the local tourist spots. I'm hooked on museums, and go to them every chance I get. I love to see how people used to live, especially the kitchens. Makes me very grateful for all the modern conveniences I have and enjoy. Can't imagine my life without my dogs, even when they get under my feet as I'm cooking. On the other hand, they're great at picking up spilled food. Hate to waste food, but don't hesitate to throw food away if it's been in the fridge longer than my three day rule. Trust me, food poisoning is no fun at all. Never, ever thought I would be/could be a food blogger, but having a blast doing it. First for the 15 recently discovered blogs, hmmmm. that required some thought, I don't actually have that many I follow. One of my interests is collecting old recipe books, predating 1960. Just an arbitrary year, actually I have cookbooks dating from 1912 to just a few years ago. It's just the old ones have such an incredible array of recipes that the new 'modern' cookbooks don't have. The oldest books I have are ones my mom had, and as I said date back to 1912. And they're in Danish as well. But that's OK, I can read Danish. And then there are a couple others that I follow because they've got some Danish recipes on them, and more than that, they're also interesting. And of course, everyone needs a good laugh now and then, and Wendy Aarons tickles my funny bone. 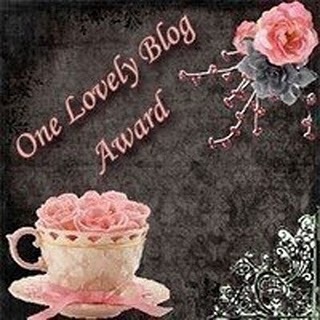 Again, thanks Gitte for the Lovely Blog Award, it really means a lot to me. #3 We recently went to Chicago and had such fun riding the train (the L) around the city. Wish we had better public transportation around here. And I do appreciate it. Of course, I'm having a blast doing this blog anyway, I love to share.